A low-key hockey tournament attracted some big names to Bretton Gate last weekend (June 30/July 1). 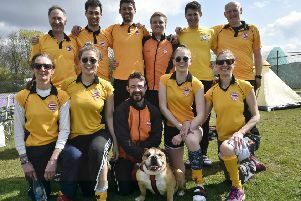 The City of Peterborough sevens event proved popular as usual with Badgers winning the men’s event on Saturday and Ragamuffins taking the mixed honours on Sunday. The men’s event was a 10-team affair involving nine round robin matches in blistering heat followed by a final. Sticky Toffee Puddings topped the standings by five points from Badgers after a gruelling day, but the latter won the cup after a penalty shoot out that went to sudden death. It was 3-3 after normal time with National League player Chris Porter of Oxted CC scoring a high-class hat-trick for Sticky Toffee Puddings. Badgers, who won the shootout 5-4, were captained by another ex-Peterborough star Grady Wing, who now plays for Preston. Ragamuffins were a team of mainly City of Peterborough players and they beat the Peaky Blinders, a team of National League players captained by former City player Tom Wadsworth, 2-1 in the mixed final. Wadsworth scored in the final, but two Jordan Heald goals proved more decisive. Peaky Blinders had pipped Camp Retro to a place in the final on goal difference. The weekend was part of another highly successful beer festival week at Bretton Gate.